Liquidwood is a new generation of biopolymers invented at the Fraunhofer Institute for Chemical Technology ICT. High-quality thermoplastic engineered materials for applications that demand from basic to high technological standards, combining the positive properties of renewable resources and natural wood with the processing capabilities of common thermoplastics. Consisting of what constitutes natural wood (lignin and cellulose) it has similar mechanical and thermal properties as natural, grown wood. 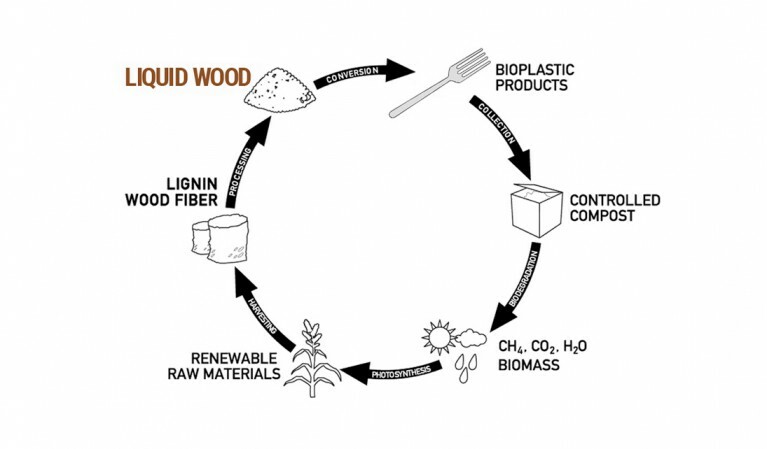 Lignin and wood fibers are among the main raw materials of Liquidwood. Lignin is a byproduct of the papermaking industry of which about 50 million tonnes are produced in various pulping processes worldwide every year. By mixing specific types of lignin with natural fibers from wood, flax, hemp, sisal or other fibrous plants together with natural additives, novel materials are produced which can be processed even at higher temperatures and injected or extruded on conventional plastics processing machines in the same way as petrochemical thermoplastic materials. Some formulations are additivated with vegetable waxes and different types of renewable raw materials. Lignin and wood fibers are processed in a proprietary manner in order to give them the mechanical and physical properties that are common in todays widely used plastic materials. We choose specific wood fibers for their mechanical performance (for example beech and fir) but almost any fiber can be used. We generally do not use food (like corn) to produce Liquidwood because we consider unethical to turn it away from human consumption transforming it into a raw material for consumer goods. Food is traded like stocks and if an adverse climatic event takes place prices skyrocket! Food, must first be converted into sugar and then acidified to obtain something that resembles plastic, also known as PLA, and has a very low temperature resistance. We, instead, add treated fibers to engineered lignin in order to obtain a material with a softening temperature of over 100 degrees Celsius! Economies of scale: we are still a small company, but growing fast, and we will reach a higher efficiency (lower material cost) through costantly increasing our manufacturing output.